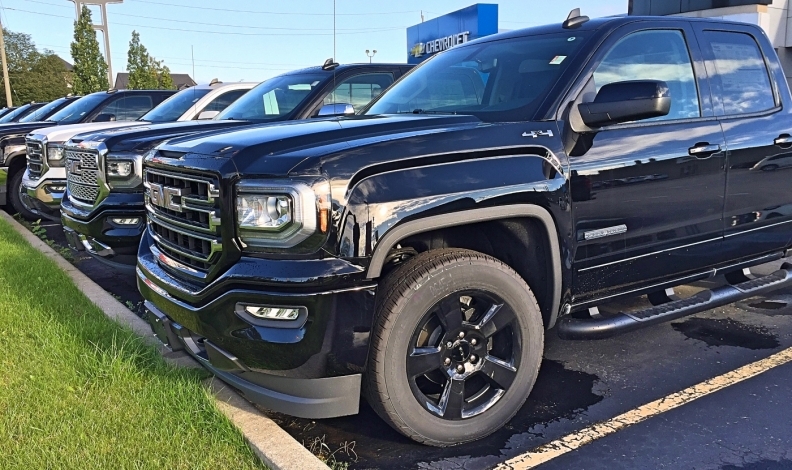 DesRosiers Automotive Consultants Inc. says new vehicles sold in 2017 hit a record for a fifth consecutive year as nearly 2.04 million units were delivered. That marked a 4.6 per cent increase over 2016 and the eighth year in a row of sales increases since the financial crisis of 2009. The annual sales level was reached despite lower sales in the last two months of the year when sales fell 1.1 per cent in December and 1.2 per cent in November, according to the analyst. DesRosiers says light trucks sales grew 8.7 per cent to nearly 1.4 million units last year. Ford led 2017 with 308,474 vehicles sold, according to the Automotive News Data Center in Detroit. General Motors followed close behind with about 302,826 vehicles sold. Automakers needed to sell about 80,000 vehicles combined in December to establish the new high-water mark for the year. But the final month of 2017 wasn't the best for some automakers as several saw sales decrease when compared with the same month a year before. Ford Canada’s December sales dropped 11.3 per cent to 17,526 vehicles, down from the 19,749 the automaker sold during the same month in 2016. Ford Canada’s sales for the year were up 1.3 per cent overall with 308,474 vehicles sold, compared to the 304,445 it sold in 2016. Despite the down month overall, the Ford F series remained Canada’s best-selling truck for the 52nd consecutive year, selling 155,290 units. General Motors Canada sold 19,801 vehicles, up 9.2 per cent over the same month in 2016. The automaker sold 302,826 vehicles for the year, an increase of 13.3 per cent over 2016. "We built momentum steadily throughout 2017, and our December results are signalling our intention to keep our brands at the front of the pack,” GM Canada’s vice-president of sales and marketing, John Roth, said in a statement. The automaker’s GMC line led all makes in sales growth by percentage in December, up 30.3 per cent. Sales of the GMC Yukon nearly tripled to 304 units while Sierra sales were up 39.3 per cent to 3,812 trucks. Chevrolet Silverado sales were up 53.4 per cent to 3,760 units, but the Chevy brand inched up only 3.2 per cent. The automaker’s biggest loser was the Cadillac brand, as sales plummeted 37.6 per cent to just 841 units for the month. For the year, Cadillac's total sales were 13,330, up 9.6 per cent versus 2016. Toyota Canada’s total sales dropped 7.8 per cent to 12,615 in December when compared with the same month a year ago. Its Lexus luxury brand suffered the biggest monthly losses, with total sales off 10.9 per cent to 1,555 vehicles. But, the luxury line still had its best year, with an annual sales growth of 10 per cent and a total of 24,765 units sold in 2017. Toyota brand car sales were down 8.5 per cent to 3,732 vehicles in December. While Corolla sales were down 11.9 per cent, Toyota saw a 21.8 per cent sales increase of the Camry — it marked the car’s fourth consecutive month of growth since the new model was introduced in September 2017. Its truck sales dipped 6.8 per cent to 11,060 units. For the sixth consecutive year, Toyota reported its best year ever for truck sales. It sold 136,586 vehicles in that segment in 2017, up 6.2 per cent compared with last year. Record 2017 truck sales were led by the Canada-made Toyota RAV4 and Lexus RX. Both vehicles had their best sales year ever in 2017 with RAV4 sales of 50,894 units, up 3.6 per cent compared to 2016, and a 15.4 per cent annual increase for RX sales, with 9,402 vehicles sold. Overall, Toyota Canada’s total sales, including Lexus and Scion brands, were up 3.1 per cent to 224,547 units. December 2017 FCA Canada sales of 17,654 vehicles were down 6.4 per cent when compared with results from December 2016. For the year, the automaker’s sales slid 4.2 cent to 267,052 units. Despite the Ram brand posting a 18.5 per cent decrease in sales last month, 2017 was a record year for the brand and its Ram pickup line. Total Ram sales were up 10.3 per cent to 103,843 units for the year while Ram pickups saw a sales increase of 10 per cent, up to 98,465 units. FCA’s Chrysler brand had a strong December, with sales up 46.4 per cent on the back of sudden Chrysler 300 sales surge and strong Pacifica sales. The automaker sold 494 units of the 300, up 186 per cent, and 638 Pacificas, up 144 per cent. But for the year, Chrysler brand sales were down 16.7 per cent to 13,364 vehicles. Mercedes-Benz ended the year selling 3,673 vehicles in December, including a small number of Smart cars and up only 0.5 per cent for the month. But the Mercedes-Benz brand itself was up 6.5 per cent to 3,649 vehicles during December. The luxury automaker sold 52,298 vehicles for the year, up 8.2 per cent. Several automakers reported sales declines in the United States. The Canadian Press contributed to this report. This report and sales chart will be updated.